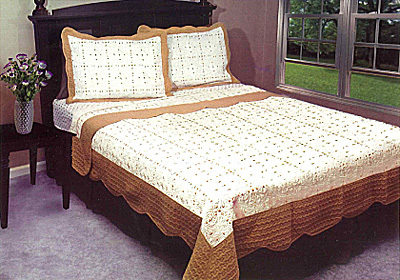 Completely finished and pre-quilted King size quilt with light brown fabric border and two pillow shams are ready to use as is or to embroider using enclosed instructions and your floss. 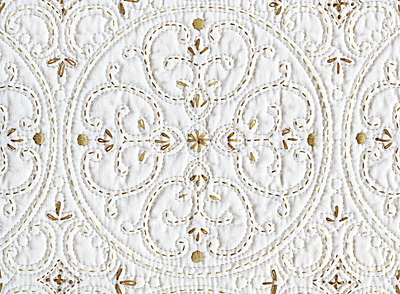 These prefinished items were made using the Matelassé technique, which yields a pattern that appears quilted or padded. Quilt measures 102" x 92" and pillow shams measure 21" x 27" each. Items are prewashed 100% poly microfiber shell with 50% polyester/50% cotton filling. Models pictured used a total of 240 yards each of DMC 420 and 422 flosses to complete.